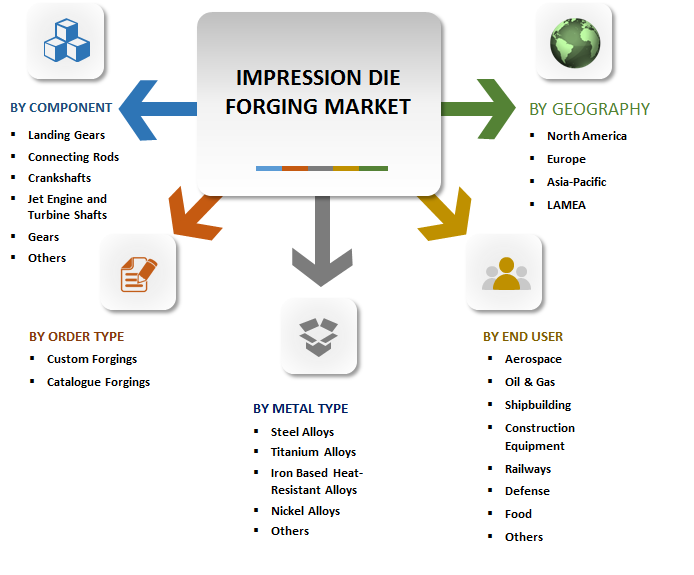 The Global Impression Die Forging Market size was $18,293.6 million in 2017, and is projected to reach $27,163.6 million in 2024, growing at a CAGR of 5.2% from 2018 to 2025.Impression die forging, also referred to as closed die forging, is a metal deformation process that employs pressure to compress a piece of metal to fill an enclosed die impression. In most of the impression die forging processes, a succession of impression dies are used to modify the material into the final desired shape or form. This process involves two dies, each containing a single impression or a series of multiple impressions that cut into each die. Typically, the bottom die is fixed in a set position and the upper die is generally raised at a height. While they are separated, desired quantity of metal is heated to a particular temperature and is positioned between them. Extreme amount of force is then applied to deform the metal, and it is forced to flow into the die chambers while the excess is removed. Two types of pressing equipment are generally used for impression die forging process: mechanical forging and hydraulic forging. The global Impression Die Forging market for impression die forging is driven by the improving global economic conditions, innovations in components and manufacturing process, and developing end user industries. The market growth is restrained by the rising input metal and labor costs and high cost of impression die forging process. The global market for impression die forging is segmented based on component type, metal type, order type, end user industry, and geography. The market is analyzed across four regions namely, North America, Europe, Asia-Pacific, and LAMEA, along with their prominent countries. Based on component type, it is classified into landing gears, jet engine & turbine shafts, crankshafts, connecting rods, gears, and others. Other components segment accounted for dominant share of the market in 2017 and is expected to maintain its position throughout the forecast period. Few components considered under others segment include pistons, flanged connectors, axles, railway wheels, shrouds, valves, piston rods, piping products, cylinders, levers, impellers, shafts, and casing. By metal type, it is divided into steel alloys, titanium alloys, iron-based heat-resistant alloys, nickel-based alloys, and others. Steel is the most commonly used metal for closed die forging owing to its versatile properties that include ductility for load bearing components, high hardness for use as a cutting tool, malleability for machining, shaping & drilling operations, and high temperature resistance. Typically, steel refers to carbon steel and stainless steel. Based on order type, the market is bifurcated into custom forgings and catalogue forgings. Custom forgings dominated the global market in 2017 and is estimated to grow at a CAGR of 5.3% during 2018-2025. Custom-forged components are used in aircraft, submarines, refineries, power-generating stations, space craft, processing plants, missiles, offshore oil rigs, pressure vessels, deep-sea submersibles, off-the-road equipment, scientific research equipment, and other specialized applications. By geography, Asia-Pacific generated the maximum revenue, and is estimated to grow at a CAGR of 5.53%, followed by North America. China is one of the largest producers of forgings, and has developed them with high precision and efficiency. Improving economic conditions: The growth of this market is associated with the economic and market conditions across the globe. Forging companies have developed lean, resilient, flexible, and adaptable operations to sustain the market competition. There is significant growth in end user industries such as aerospace, oil & gas, shipbuilding, construction equipment, and others. This has created high demand for closed die forged components among low cost manufacturing countries such as China and India. 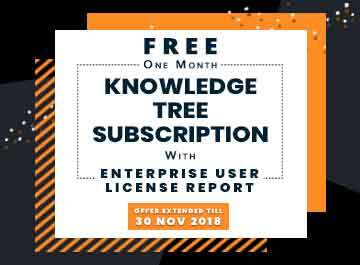 The impact of this factor is high in developed countries and is expected to have an impact on the markets in the developing countries in the near future. Innovation in equipment and process: There has been an increase in demand for complex and innovative products in the fast developing end user market. Equipment suppliers have focused on developing new products with automated closed die forging process. These new machines have the capability to forge extra-large nickel- and titanium-based alloy parts for commercial aerospace applications. The impact of automation on the growth of the global impression die forging market is moderate in the present scenario, but is expected to increase during the forecast period. Growth in end user industries: The key end user industries in the market include oil & gas, aerospace, shipbuilding, defense, and others. Increase in investments in these industries is expected to propel the demand for forged components. For instance, heavy investment in the oil & gas sector is expected to boost the demand for forged products such as drill heads and gas lift mandrels. Major players operating in this market include ATI, Aubert & Duval, Bharat Forge Limited, Bifrangi SpA, Böhler Schmiedetechnik GmbH & Co KG, Ellwood Group Inc., Mahindra Forgings Europe AG, Maschinenfabrik Alfing Kessler GmbH, Nippon Steel & Sumitomo Metal, Riganti Spa, SAMMI Metal Products Co. Ltd, Siderforgerossi Group S.p.A, Siepmann-Werke GmbH & Co. KG, and ULMA Lazkao Forging. The global market for impression die forging market is estimated to witness significant growth over the forecast period. It is driven by the improving global economic environment, rising innovation in components and processes of impression die forging and growing end user industries. Impression die forging is a metal deformation process where pressure is used to compress a piece of metal to fill an enclosed die impression. This method is typically used to produce complex components using open-die forging or other metal deformation processes. Companies operating in the impression die forging market are developing competencies in computer aided designs and forming close collaborations with other players in the value chain to gain competitive advantage. Although the volume demand from aerospace sector is comparatively lower than other end users, this segment contributes significantly to the revenue of the impression die forging industry as it demands components forged from carbon and alloy steel, titanium and nickel/cobalt alloys in their manufacturing and assembling of commercial as well as military aircrafts. The rise in production of commercial and military aircrafts is expected to have significant impact on the impression die forging market during the forecast period.